Today's blog subject is quite an interesting one. I don't normally look at how far I have come, I look at what I want to do next. 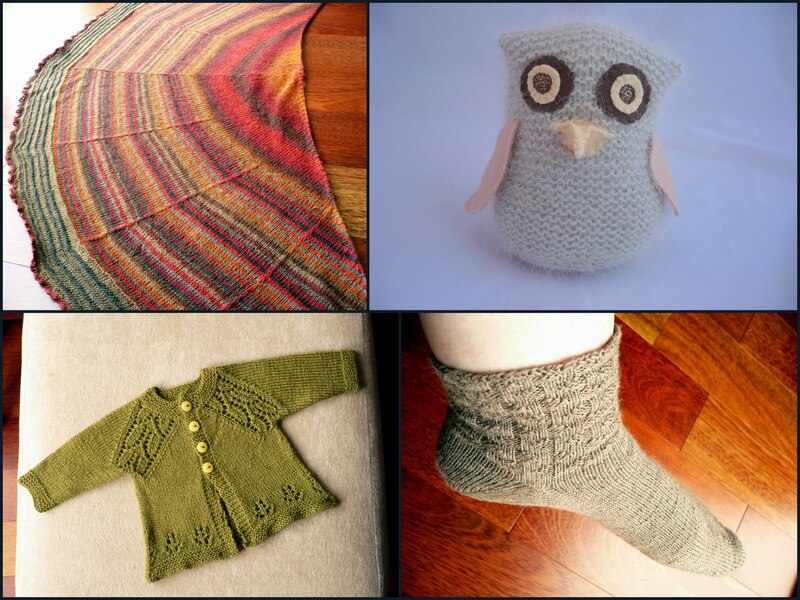 So to fulfill the topic criteria I decided to look at a snapshot comparison between the projects I knit in March last year and March this year. Here are the projects I completed in March 2010. If I do a similar collage of projects finished in March 2011 what do we see? In March 2010 the Argus Shawlette was one of my first lace shawls. I really enjoyed knitting it and it gave me lots more confidence to try some more lace knitting. 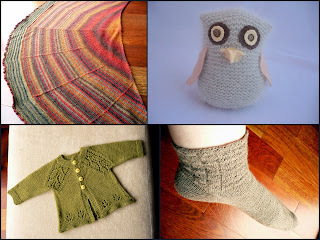 Now in March 2011, the Maile Cardigan with it's lace raglan decreases, really was a very simple pattern for me. It was a different construction to those I've used before, but I understood it very easily and the pattern felt quite straightforward. I'm now pretty comfortable knitting in 4-ply or sock weight yarn and even in lace weight yarn, which in March 2010 I hadn't even attempted yet. In March 2010 I was in a felting phase. I really enjoyed playing with wool and the washing machine. I made lots of pairs of slippers during that time and the pink purse I made, was in no way as polished as one I would make now! You certainly wouldn't find the zip visible on top of the lining fabric! I am much more inclined to spend time and effort finishing projects off more carefully, which you can see from the owl I made this year. In fact it was in March last year that I first attempted continental knitting. Knitting in this fashion has sped up my knitting significantly, which means I am less afraid of big projects. The Daybreak Shawl is one of my first attempts at using slip stitch in my knitting to create patterns. I can't believe it has taken me so long as it is such a simple and effective technique. I think this shawl is the reason I was drawn to the Heliotropic Pullover. It seems once I find something I like, I repeat it until I get bored. At least that is one way of making sure the technique is embedded in my mind. One important thing I've learnt this year, is how to stretch my yarn choices a little. 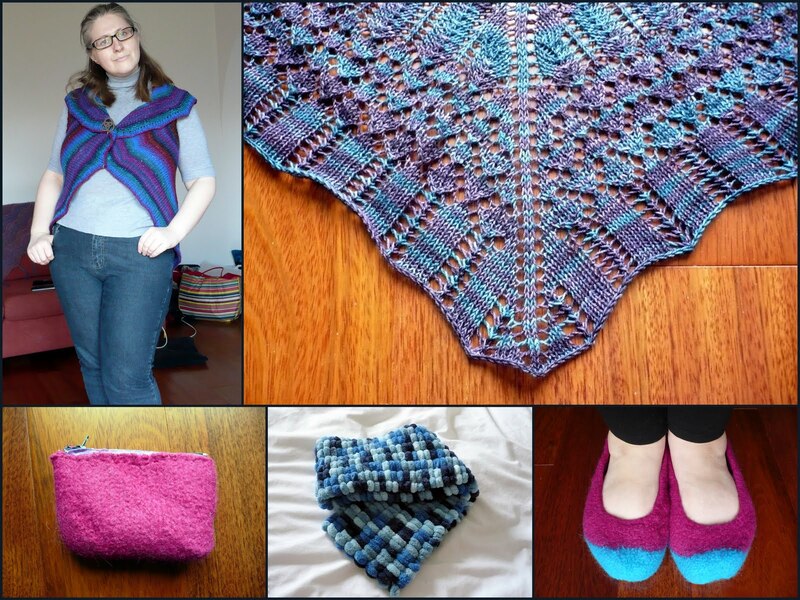 A few months ago I looked at my project page on Ravelry and realised that nearly all my projects were blue, purple, pink or teal. I decided that I needed to stop reaching instinctively for the same colours and types of yarn that caught my eye, but to carefully look at all the colour choices and select more carefully in order to expand my wardrobe. I also need to select yarn according the the project and the recipient, be that myself or someone else. I'm trying to be much more selective and careful in both my yarn and my project choices. The socks I've been making over the last couple of months are an example of pushing myself to use up my yarn stash and to avoid buying on a whim when I have perfectly good yarn in my possession. Looking at the collage for March 2010 I know that all of the yarn used was a spontaneous purchase that I couldn't resist. The March 2011 collage is slightly different. In March 2011, the shawl was created by buying a skein of yarn that contrasted with an existing skein that was a previous impulse buy. That second skein was bought in order to make this particular shawl so that I could use up existing yarn and make a project that would be beautiful and useful to me. The baby cardigan had yarn bought especially for it. I wanted to make that particular cardigan, for a particular baby, which also meant trying a different cardigan construction. I wanted to use this gift project to try something different. I didn't have any yarn in 4 ply that would be suitable for a baby, which meant a purchase. I didn't mind buying yarn for this project as I felt that not only would it be a nice gift, but I would be stretching myself a little too. The yarn for the owl ,while being an impulse buy, was bought specifically to make this project, which also used up existing felt supplies. All of the project this month are what I would call mindful projects that stretch my skills and use up my stash. It is only by thinking before each purchase, "does this yarn fill a void that needs filling or is is surplus to requirements", that I am able to resist the lure of the new pretty yarn and actually knit things I need. Mind you, that owl I made was something I couldn't resist, but in the end he went to a good purpose. I don't want to stop all yarn purchases, I just want to think more carefully before each one. It is making me a more mindful knitter, very slowly but surely. I think more than any technique, this is making me a better knitter. Being a more mindful knitter is my Skill + 1UP. If you want to check out all the other blog posts with this topic, you can click here. It is so interesting to see how everyone approaches the same subject material.